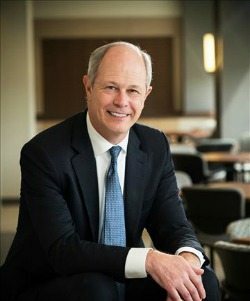 Kevin Phillips, president and CEO of ManTech International, is among the finalists for the Northern Virginia Chamber of Commerce and Professional Services Council’s annual Greater Washington Government Contractor Awards in the Executive of the Year category for companies greater than $300 million. The winners will be announced at an awards program Nov. 5. WashingtonExec spoke with Phillips about advice for his children, qualities of a great leader, and a turning point in his career. Phillips: Let’s make that three. The qualities I believe most important are listening, customer engagement and flexibility. I regularly meet with employees both to present our strategy and business objectives and to solicit their input. Good leaders attract good employees, and listening to your people — and weighing their ideas — leads to a stronger mission-focused organization and conveys trust, which is essential to any successful business. This same level of engagement applies to customers. It is essential to meet with them regularly to listen to their foremost challenges, and deliver on resolving these challenges in ways that surpass expectations. That level of engagement also builds trust and leads to lasting partnerships. Finally, a good leader must be flexible and demonstrate that quality with both employees and customers. One of our customers put it best in saying that they hired ManTech not only because they liked our approach to their mission requirements, but that we understood where they need to be in the future. Phillips: Direct, to the point and decisive. Phillips: Joining ManTech in 2002 through the company’s acquisition of CTX, and having the opportunity to work for a great industry leader and mentor, Executive Chairman George J. Pedersen. He is one of the true pioneers of our industry. George has always made our customers’ mission his chief priority, followed his own lead in finding the best way to achieve that goal, and been fully confident of the outcome. Phillips: Government contracting is a lot more than a job — it’s a vocation. Successful leadership in this business is not measured in dollars alone, but first and foremost in how faithfully and well the work we do serves our country. Our approach is simple and deliberate — delivering solutions that transform the performance of America’s national security initiatives in an era fraught with increasingly complex threats. WashingtonExec: What advice would you give your kids? Phillips: Over the years, I have given my children two bits of advice that I believe are important. First, to be a thought leader requires that you do a little thinking. Second, believe in yourself and work hard, and you can accomplish whatever you set out to do. Our daughter is a doctor of medicine and our son is a successful systems engineer. I would like to think these words had some influence in shaping their successful lives.